A detailed guide on how to create, manage and run toolbox items in SimpleHelp. The command to run on the remote machine. Any files and folders that need to be copied to the remote machine prior to launching the command. Additional information that helps SimpleHelp know when it can run a command, and what to do with the output. Toolboxes present a convenient way to automate support tasks using SimpleHelp. Toolboxes are created and managed in the Technician Console. Log into SimpleHelp as a technician and switch to the Toolbox tab. Initially you will have no toolboxes setup. Create a New Toolbox - create and configure a new toolbox. Import a Toolbox - import a toolbox that has been shared by another technician. Details on how toolboxes are shared is detailed in the Sharing Toolboxes section below. When you create a tool you can provide the following configuration properties. The name of this tool. The name will be shown under its toolbox when a tool is to be executed. Select the target operating system. SimpleHelp uses this information to only present tools that can be run on a particular machine. A set of individual files or folders that are synchronised with the remote machine before the tool is executed. Choose whether SimpleHelp should run a single command line, or should instead execute a specified script. The command to run on the remote machine when the tool is executed. The specified command will not be run within a command line interpreter , and will be launched directly. See the section titled Shells, Interpreters and Return Codes below for additional information. The directory in which the resources will be copied, and from where the command will be launched. This is optional, and if omitted a temporary directory will be used. Choose whether SimpleHelp should wait for the launched tool to complete before returning. Optionally specify the return code which designates that the command has succeeded. SimpleHelp uses this information to indicate success or failure when the tool is run. This command returns 1 to SimpleHelp, and can subsequently be interpreted by your tool to determine success or failure. Toolboxes can be shared with technicians in the same group as the creator, or with all technicians. If the toolbox is to be shared then a description can be provided that will be shown to other technicians when the toolbox is imported. To import a shared toolbox a technician can press the Import button. SimpleHelp will then return a list of shared toolboxes that are visible to this technician. Check the toolboxes that you are interested in importing and they will subsequently be shown in your list of toolboxes. You can run any tool within a toolbox by clicking on the tool. Once the tool is complete the technician will be able to see the return code, as well as any output that the tool produced. 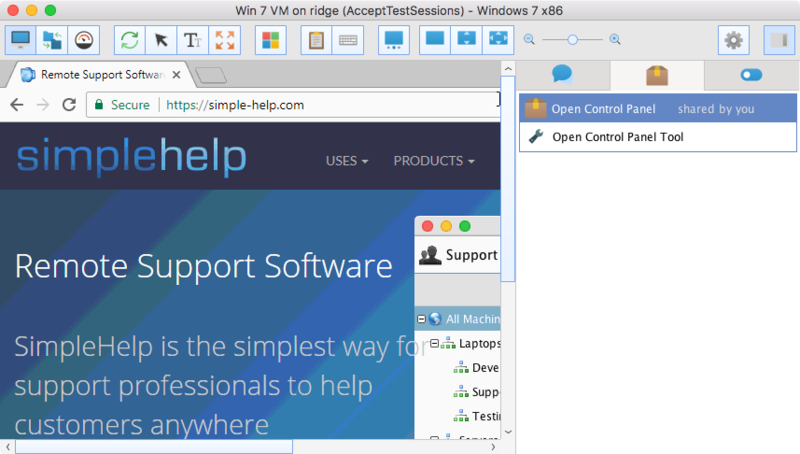 SimpleHelp also allows you to batch execute tools across multiple machines concurrently via the Access tab, or run them on a schedule using a Custom Alert. Since batch execution of toolboxes and custom alerts are Remote Management features, they require a Business license. If you are interested in this functionality please see our Remote Management Guide. The following example commands are provided to illustrate how tools can be specified in SimpleHelp to perform different tasks. The tools are not comprehensive, and often for more advanced functionality scripts should be used instead. The following tools can be executed on Windows. Note that in most instances cmd.exe /c can be excluded if the tool is configured to run a Batch Script.